The hanger steak is a thick strip of meat from the underside of the cow. It hangs (hence the name) between the rib and the loin. It is part of the diaphragm and, like a skirt steak and is full of flavor. The hanger steak has a grainy texture which is great for many dishes like fajitas or bulgogi. Combine balsamic vinegar with oil, Worcestershire sauce, soy sauce, water, brown sugar, sea salt, garlic powder, and black pepper. Mix until the sugar is dissolved. Set aside 1 cup/240 mL of marinade mixture in separate bowl. Place hanger steaks in a resealable plastic bag. Pour marinade over steaks, seal bag, and turn to coat. Place bag in the refrigerator and marinade meat for 3 to 4 hours. Place reserved 1 cup/240 mL marinade in small saucepan. Bring to a boil and reduce heat. Cook for additional 4 to 5 minutes until sauce is thick and coats the back of a spoon. Make sure to stir often during the cooking process and also, watch for burning. Set aside and allow to cool. Vinegar will continue to thicken as it cools. If it gets too thick, simply stir in 1 to 2 tablespoons of water to the mixture and reheat right before serving. Remove hanger steaks from bag and discard marinade. Place meat on the grill and cook for 3 to 5 minutes per side. Once steaks have reached the desired doneness, remove from grill and let rest for 5 minutes before plating. 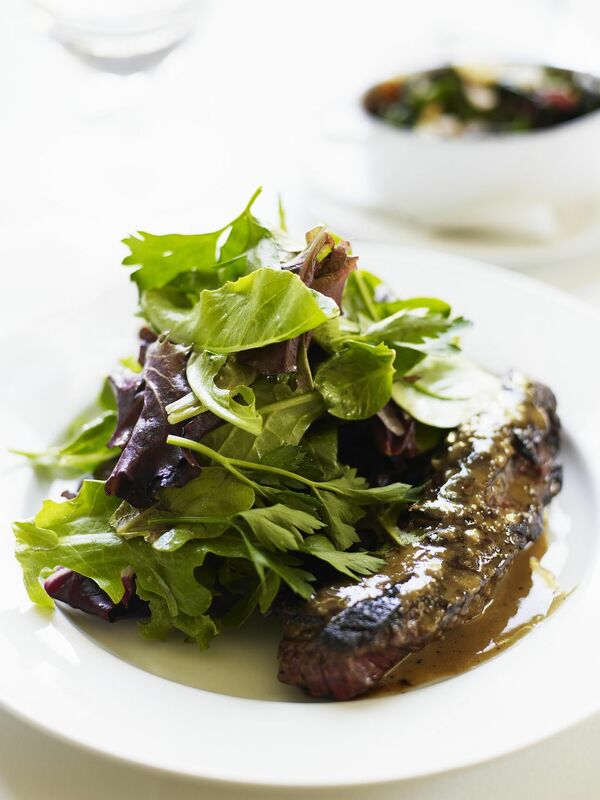 To serve either slice or serve steaks whole with warmed balsamic sauce drizzled over top.